The events in the life of Jesus as recorded in the New Testament have the power to transform us. 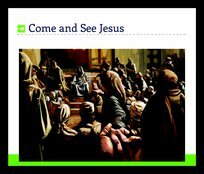 Come And See Jesus invites all of us to take a fresh look at Jesus and His interaction with others in His sojourn here on earth. If we are open to the Spirit's leading, we will be changed by the same power Jesus displayed in His ministry on our planet. Since most of these expositions are from the gospel of Matthew, you can use these messages in your personal study of the book, or invite others to study the individual passages with you. You will find lasting help with this encounter with Jesus the Savior of men.